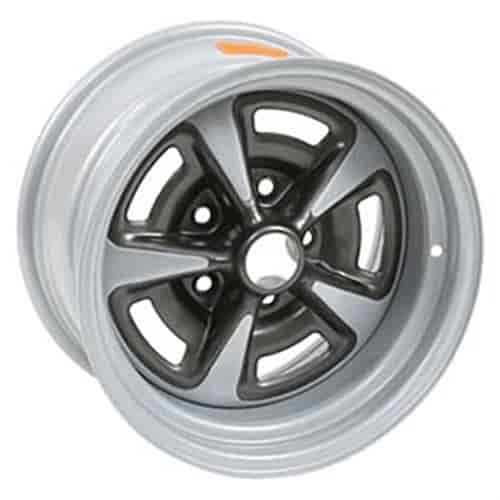 Wheel Vintiques 60-Series Pontiac Rallye II Wheel Size: 15" x 8"
Available powdercoated or chrome to match OE, these replica rims have the standard Pontiac 5 x 4-3/4" bolt pattern. Unlike other replicas, they can use factory GM caps, lug nuts, and trim rings (all sold separately). 60-5834042 is rated 3.0 out of 5 by 1. Rated 3 out of 5 by vincie from good looking wheels I just purchased these to replace the original 14 inch Rally 11 wheels on my Pontiac Ventura. They looked very good and just like the original ones. The only problem I have is that the dark gray paint around the lug nut holes and the center cap hole chipped right away during install. it didn't scratch as much as chip away. I contacted Jegs and they were nice enough to offer a return or replacement but that is not easy as I threw the 14 inch tires away that were on the car so I have no tires with rims to put on the car while I return them. I am trying to figure out what to do. Wheel Vintiques 5000 - Pontiac Motor Division Center Cap Black with Red "PMD"
Wheel Vintiques 3002 - Trim Ring 15 x 8"
Wheel Vintiques 3001-A - Trim Ring 15 x 7"
Wheel Vintiques 3001-15 - Trim Ring 15 x 7"